Renacer 106.1 live broadcasting from PuertoRico. 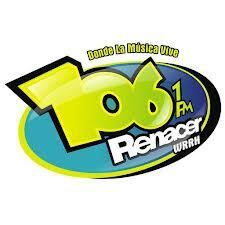 Renacer 106.1 is one of the most famous online radio station on PuertoRico. Renacer 106.1 have a new musical alternative to ti.Tenemos the greatest variety in sacred music, 24 hours a day, seven days a week, carrying a positive message with NO programming chabacana.Renaceres the main link to the social development of our country besides being the means of communication to a broader range of audiences.